Over the past few years, Americans have been fostering a growing love affair with the culinary phenomenon that is food trucks. Food truck culture, whose humble roots date back to the lunch wagons of the late 1800s, has veritably exploded outward from its modern-day precursors of construction-site vendors armed with basic fare for people on the go. Today’s food trucks offer menus that range from guilty pleasures to gourmet. Many have found a niche with ethnic cuisines previously unavailable to customers in certain parts of the country. With daily offerings at their whim, they can dare to be daring, free to experiment with fewer consequences than chefs in conventional restaurants. And all have the added benefit of being able to pack up the whole production and go – to festivals, events, or just the other side of town. People tend to associate food trucks with bustling metropolises. But the craze has been steadily expanding to small communities, as well, and Artesia is now among that number. A small but popular collection of food trucks can be found parked around the City of Champions, and they’ve quickly built a devoted following. Over the next few weeks, the Daily Press will be profiling these road warriors of the food world and the tempting delights that are expanding Artesia’s culinary options. If you happened to drive down Main Street around lunchtime prior to the end of the school year, you likely noticed a crowd of teenagers piled into the vacant lot on the southeast corner of the 11th Street intersection. If you looked closer, you saw what they were hovering around – the little black trailer that is P-nuTT’z: The Little Place to Feed Your Face. 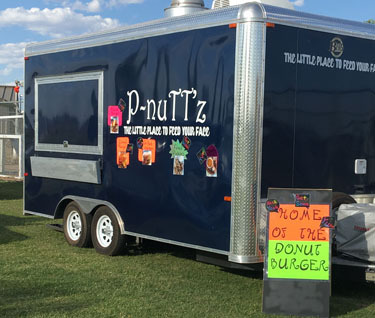 The students, affectionately known as “my kids” by P-nuTT’z owner Jennifer Butler, were her primary motivation for opening the food truck in January of this year. “It was costing a fortune daily for my daughter to eat, and we thought by opening a food truck and pricing it so everyone could afford to eat, we would not only be helping our household but other households in our community,” says Butler. P-nuTT’z was an immediate hit with the Bulldogs, and Butler says her adult customers quickly learned to either beat the Artesia High School lunch bell or wait till the hour was up. Butler’s menu is loaded with classic options such as nachos, Frito pie, hot dogs, pretzels, cheese sticks, French fries, onion rings, and chicken strips. 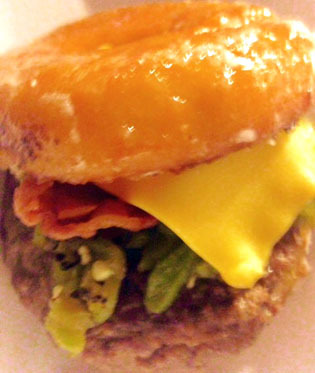 But her biggest sellers are the sort of indulgences that tend to draw people to food trucks – items like the Donut Burger (aka Home Run Burger), a quarter-pound beef patty topped with green chile, cheese and bacon, all sandwiched between a glazed doughnut. “But once they try it, they are definitely happy they did,” she says. 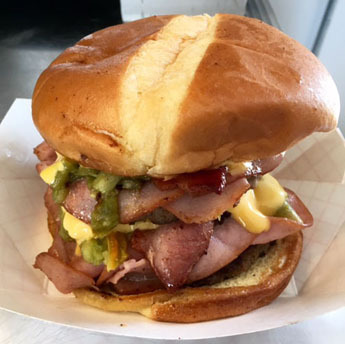 Another growing favorite is the Pig Out Burger – double meat, ham, bacon, cheese and green chile. Also popular is The Dogpile, named for the Bulldog football team’s legendary pregame ritual. “We had to call it The Dogpile for our Artesia football fans,” says Butler, who is often asked, “How do you eat this thing?” of the bacon-wrapped, half-pound hot dog loaded with chili and cheese. 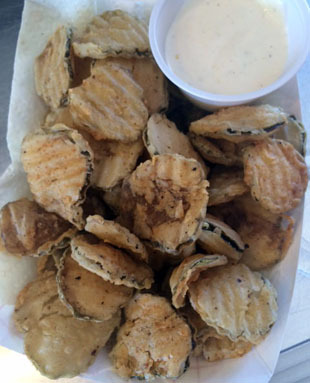 Fried foods are another food truck hallmark, and the fried pickles and fried peanut butter and jelly sandwich at P-nuTT’z are in high demand, as are the fried desserts – Oreos, cheesecake and Twinkies. There are also menu items available for the health conscious, including a grilled chicken salad and chicken lettuce wrap. Butler is proud to call her food truck a veteran-owned business, as her husband, Gary, is a U.S. Army vet, and enjoys the mobility that comes with an eatery on wheels. “We enjoy the flexibility of being mobile for specialty events, catering, and last-minute calls to come to them and feed their party!” she says. Butler and her crew – which also includes mother Virgie and children Haylee and Corbyn – have taken P-nuTT’z on the road to such events as this past weekend’s Wet ‘n Wild Tour and Hike It and Spike It over Memorial Day weekend. Upcoming events for the truck will include the UFO Festival in Roswell, the Summer Throwdown, Smokin’ on the Pecos, the Eddy County Fair, and the Eastern New Mexico State Fair. P-nuTT’z can be found at the corner of 11th and Main from 11 a.m. – 2 p.m. weekdays and is on Facebook and Instagram. “P-nuTT’z: The Little Place to Feed Your Face is fun food for all ages,” says Butler. “We have the everyday person that works out enjoying our delicious grilled chicken to their beautiful children getting plain chips.